Caterpillar Host Plants: Poikilospermum suaveolens (Urticaceae). A Chocolate Sailor sunbathing on a perch in a wasteland. A Chocolate Sailor resting on a perch. On both wings the cells are open, and vein 8 on the hindwing ends on the costa. 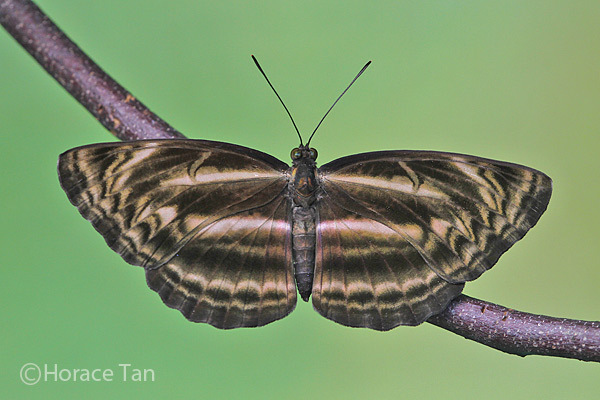 In the male, veins 6 and 7 on the hindwing are parallel for only one third their length. N harita, in contrast to the other two black-and-white Neptis species (N. hylas and N. leucoporos) in Singapore, has the usual markings pale, narrow and suffused with brown. Above, the post-discal spot in space 2 of the forewing is crescentic or oblique. On the hindwing, the male has a speculum so large that it obliterates the discal band in spaces 6 and 7. Underneath, the discal band on the hindwing is almost white, with its inner edge directed to costa between ends of veins 7 and 8. Dark fascia lying beyond the post-discal band are narrow and almost catenulate. 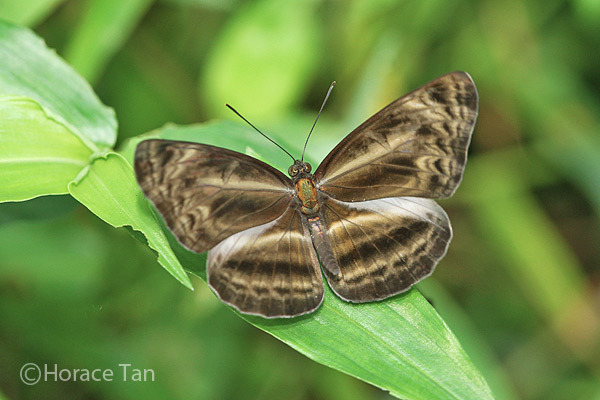 A male Chocolate Sailor flapping its wings, exposing its broad whitish speculum on the hindwings. 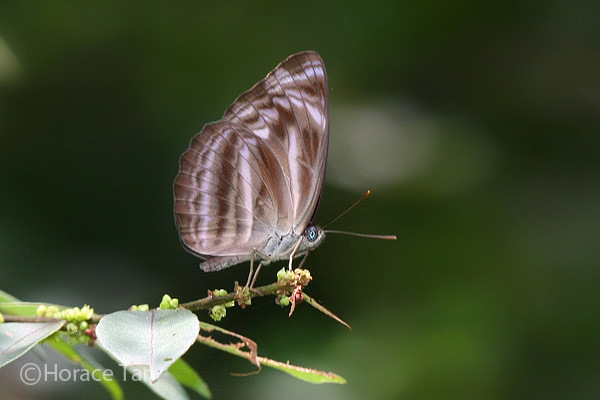 A Chocolate Sailor on a flowering branch of Bridelia tomentosa. A Chocolate Sailor puddling on damp ground. 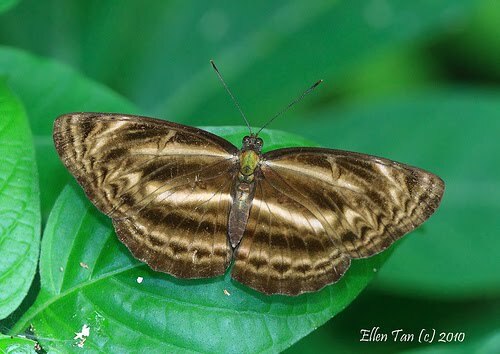 This species is uncommon in Singapore, and its occurrence is restricted to several sites in the catchment reserves and northern wastelands. As with other Sailors, the adults are sun-loving and fly in a slow "sailing" fashion. They also visit flowers and ripening fruits for energy intakes. A Chocolate Sailor enjoying a quiet moment on a perch in the nature reserve. 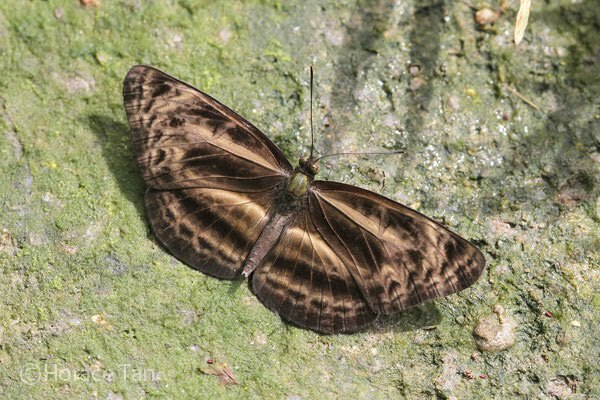 A sunbathing Chocolate Sailor in the nature reserve. 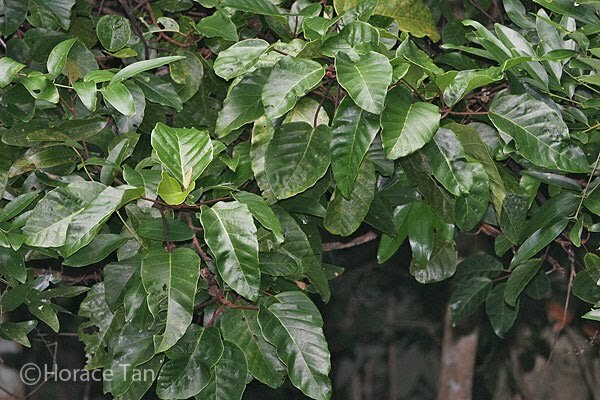 Thus far, only one local host plant, namely Poikilospermum suaveolens, has been identified. Special credits are due to two avid ButterflyCircle members, Ellen Tan and Nelson Ong, who chanced upon a female Chocolate Sailor ovipositing on this plant. Their discovery of the host plant and subsequent sharing of their find are crucial to this life history documentation. The host plant is rare in Singapore, and this likely accounts for the infrequent sightings of Chocolate Sailors locally. 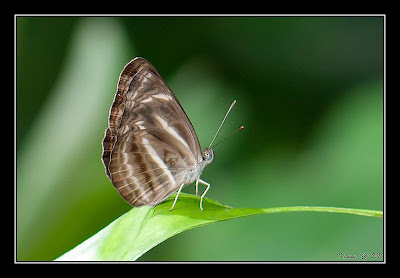 A female Chocolate Sailor ovipositing an egg at the leaf tip of its host plant. 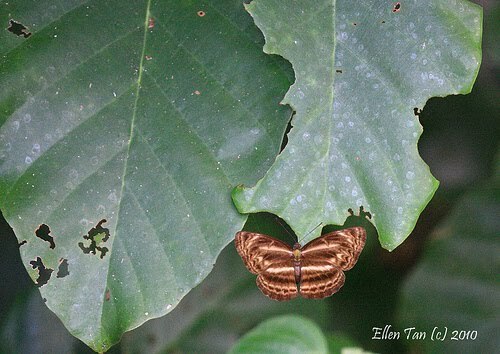 Caterpillars of the Chocolate Sailor feed on mature leaves of the host plant. 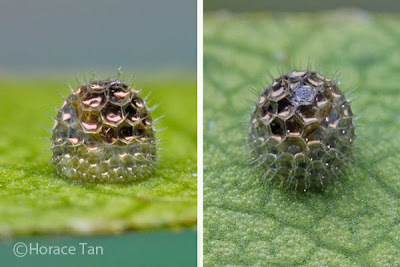 As with other Neptis spp., the early instars of the Chocolate Sailor eat the lamina of each leaf from the tip, or from a damaged and protruding edge, with the midrib typically left uneaten and used as a resting site. Rather than feeding in the open on the leaf surface with no defensive decoy (as in N. leucoporos) or by cutting and hanging leaf fragments for concealment (as in N. hylas), the earlier instars of the Chocolate Sailor construct frass chain (as a possible concealment tool) from the tip of the midrib or a damaged edge, very much like Athyma spp., the Commander and the Colonel. However unlike these other species, no frass barrier is observed to be utilized by the Chocolate Sailor. The eggs of the Chocolate Sailor are laid singly at the tip of a leaf on the host plant, or on the leaf underside of a mature leaf of the host plant. The ovipositing female adopts the same common ovipositing routine for most Nymphalidae species: After landing on a selected leaf , the female reverses along the leaf surface until its abdomen tip reaches a suitable spot where it then deposits an egg. 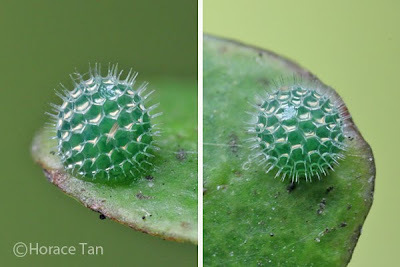 Two views of an egg laid at a leaf tip. Diameter: 1.1mm. Each egg is somewhat globular in shape, with the surface marked with hexagonal pits and and thin spines at pit corners. The micropylar sits atop. Freshly laid eggs are green in colour, but turning pale green and then yellowish when maturing. Each egg has a diameter of about 1.1mm. The egg takes about 3-4 days to hatch. The young caterpillar emerges by eating away part of the egg shell. After emergence, the newly hatched will consume more of the egg shell as its first meal. 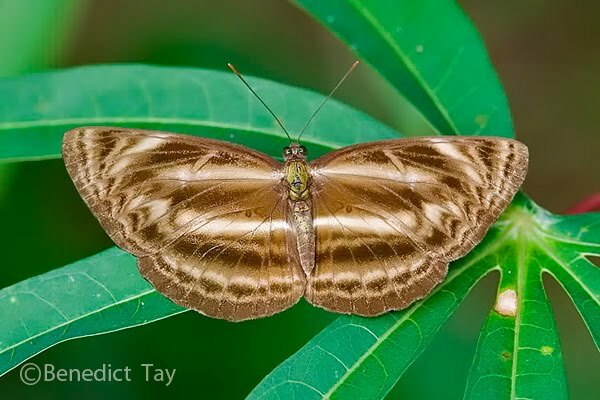 Strangely, unlike most Nymphalid spp., where the new born completely consumes the egg shell, the newly hatched of the Chocolate Sailor does not seem to be keen on doing likewise (based on field observations of three leaves with 1st instar caterpillars, and one hatched in a breeding setup). 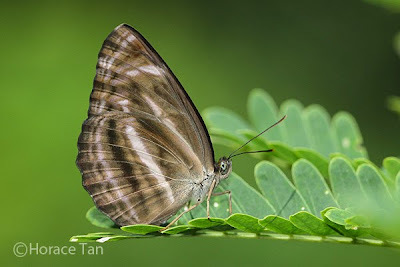 Its cylindrical dark green body is covered with many small tubercles and short setae. The head capsule is deep dark brown with a paler brown fringe. 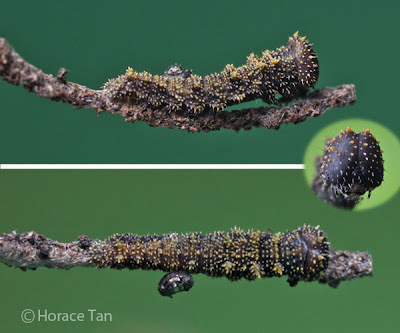 A newly hatched caterpillar, length: 2.3mm. Six pairs of subdorsal tubercles are somewhat larger than the rest, and they are found on the 2nd and 3rd thoracic segments, 2nd, 4th, 7th and the 8th abdominal segments. These will go on to become more prominent branched spines in later instars. 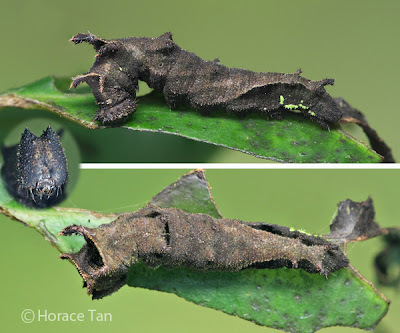 The 1st instar caterpillar goes about the task of constructing its first frass chain as soon as it has its first `leafy' meal. Noteworthy is that it adopts the same `rear-loading' method of frass chain construction as depicted in the video clip for the Colonel. 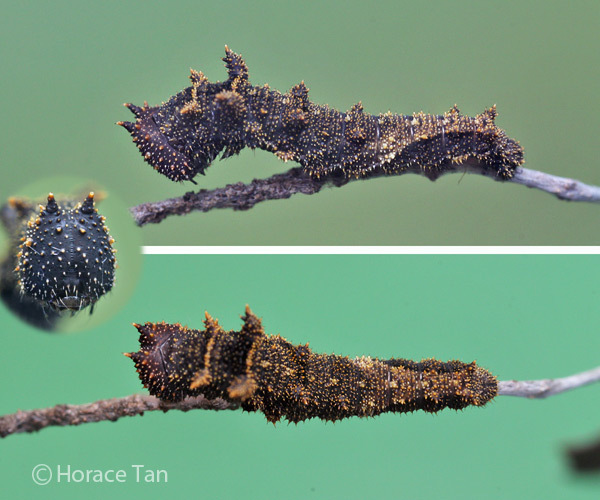 After reaching about 4.5mm in 3 days, the caterpillar moults to the 2nd instar. Two views of a 1st instar caterpillar resting on its frass chain, length: 3.2mm. 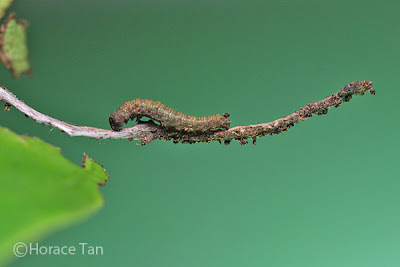 1st instar caterpillar doing maintenance work on its frass chain. Late in this stage, length: 4mm. 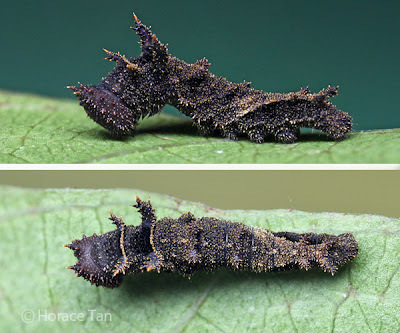 The body color of the 2nd instar caterpillar is dark brown with many tiny yellowish brown tubercles covering its body surface. 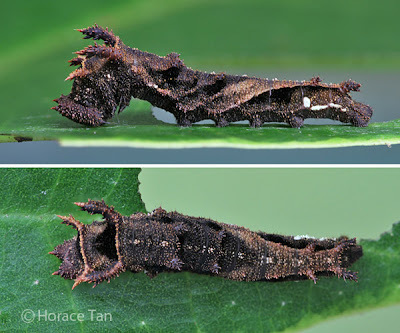 Branched spines, still short in length and yellowish brown in colour, replaces the six pairs of subdorsal tubercles seen in the 1st instar. The outline of a dorsal saddle stretching from the thorax and slanting up the sides of the 6th-8th abdominal segments are vaguely visible. The head capsule is dark brown and dotted with a number of yellowish brown conical tubercles amongst which is a longer and more pointed pair near the apex. This instar lasts about 3 days with the body length reaching about 7.5-8.5mm. In the 3rd instar, the six pairs of subdorsal spines are much longer and larger, with the pair on the 3rd thoracic segment longest, and the pairs on the 2nd thoracic and the 8th abdominal segments second longest. Each thoracic pair of subdorsal spines are joined through a transverse series of yellowish brown tubercles. Its dark head capsule is proportionately longer vertically, and the pair of apical spines now longer, more pointed and yellow-brown tipped. The dorsal saddle is now more distinctly outlined at the posterior segments, with the pale to yellowish brown saddle contrasting strongly with lower dark brown body surface. This instar takes about 3 days to complete with body length reaching about 12-13mm. The caterpillar maintains the habit of constructing frass chain up to this instar. 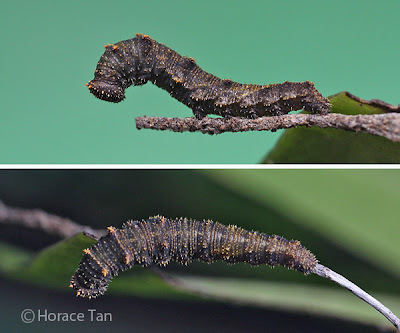 If moved to a new leaf at this stage, the caterpillar will proceed to construct a new frass chain soonest. 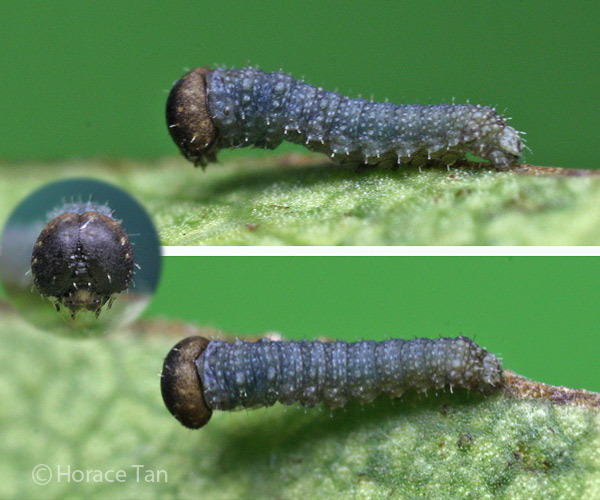 Two views of 3rd instar caterpillar, later in this stage, length: 11mm. The 4th instar caterpillar resembles the 3rd instar caterpillar closely. Laterally oblique dark streaks are seen in the dorsal saddle. The subdorsal spines becomes longer and more prominent. A few lateral patches, small and narrow, white to pale green in colour, appear on the 7th and 8th abdominal segment. Dark patches appear on the dorsum between the 3rd thoracic spines and between the 2nd abdominal segment. 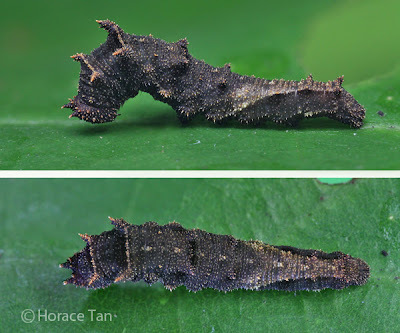 This instar lasts 3 days with body length reaching about 16-18mm. Two views of a newly moulted 4th instar caterpillar, length: 11mm. The 5th instar caterpillar has much larger subdorsal spines on the 2nd and 3rd thoracic segments, and both pairs are forward pointing, in contrast to the remaining 4 pairs which are rear-pointing. The dorsal saddle is pale brown to greyish brown in colour. Lateral patches on the 7th and 8th abdominal segments are now larger and more prominent. Initially whitish, they turn lime green gradually in one to two days. 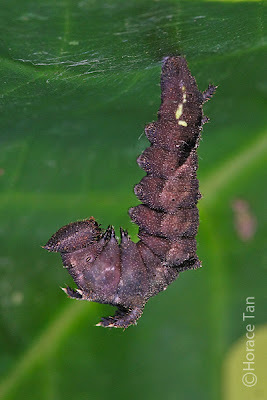 A 5th instar caterpilla, early in this stage, length: 20mm. 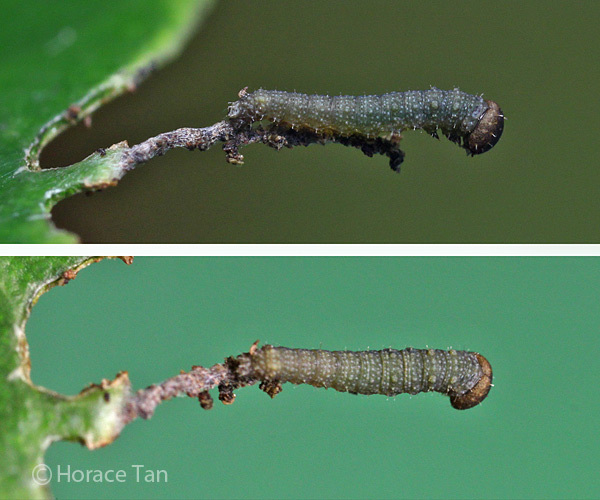 Two views of a 5th instar caterpillar, lengths: 26mm. 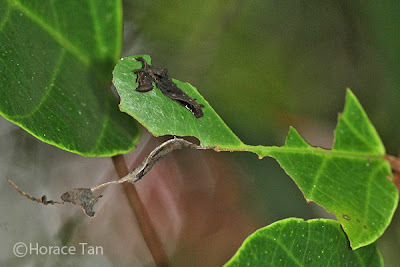 Between feeds, the caterpillar rests on the leaf upperside with its thorax raised and head pointed downward. It has a strong tendency of leaning one side of the anterior on the substrate, giving the impression of a `sleeping' caterpillar. A 5th instar caterpillar found on a leaf in the field. Two views of a 5th instar caterpillar, late in this stage, length: 30mm. The 5th instar lasts for about 5-6 days, and the body length reaches up to about 30mm. On the last day, the color of the body and the spines changes to reddish brown. 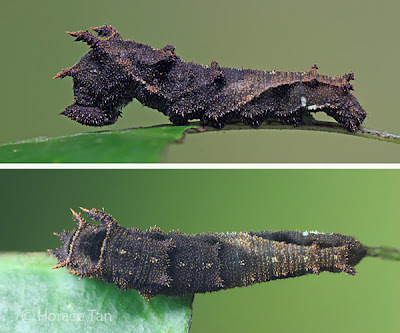 The caterpillar ceases feeding and wanders around. 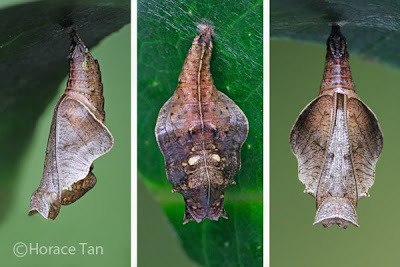 Eventually it comes to a halt on the underside of a leaf where the caterpillar spins a silk mound on a chosen spot from which it soon hangs vertically to take on the pre-pupatory pose. A pre-pupa of the Chocolate Sailor. Pupation takes place a day later. 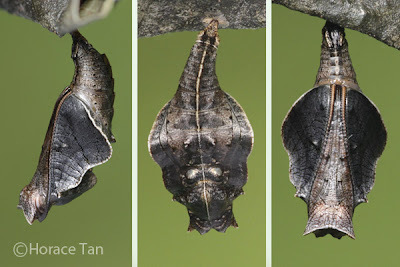 The pupa suspends itself via a cremastral attachment to the silk mound with no supporting silk girdle. It is almost entirely pale brown to pinkish brown in color. The abdominal segments are slender. The thoracic portion being larger with wing cases dilated laterally. The dorsum of the thorax is angular. The head is bluntly cleft at its front edge with small pointed lateral vertices. A pair of silver oval-shaped patches occurs on the dorsum of the metathorax, and a much smaller pair on the 1st abdominal segment. The pupa has the ability to flex laterally when disturbed. 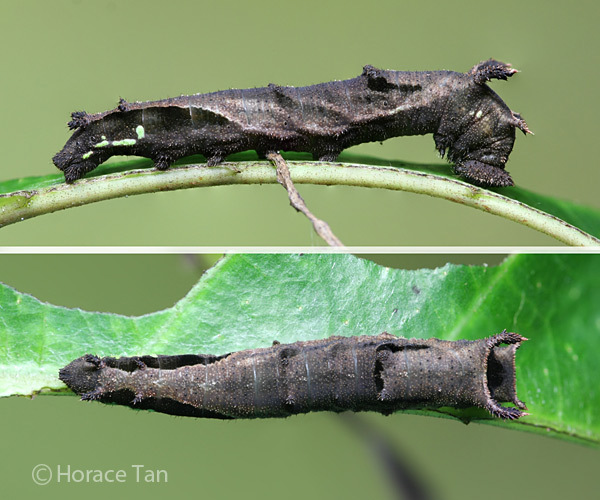 Length of pupae: 17-18mm. Three views of a pupa of the Chocolate Sailor. After about 5 days of development, the pupal turns dark as the development within the pupal case comes to an end. 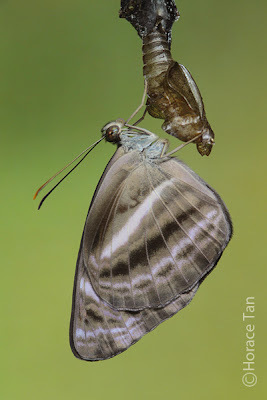 The next morning, the adult butterfly emerges from the pupal case. A newly eclosed Chocolate Sailor drying its wings on the empty pupal case. A newly eclosed Chocolate Sailor. 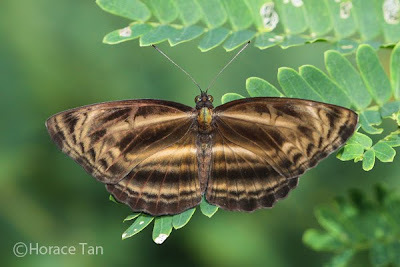 The Butterflies of The Malay Peninsula, A.S. Corbet and H.M. Pendlebury, 4th Edition, The Malayan Nature Society.